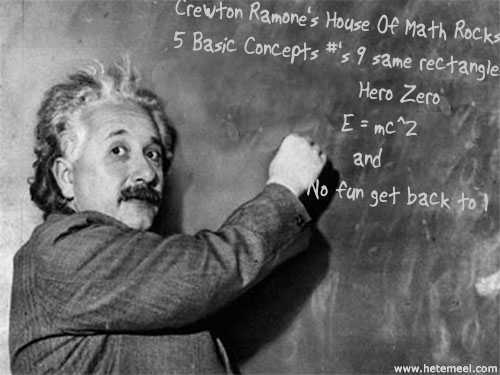 Crewton Ramone is hosting a TEN HOUR LIVE Math seminar on MAUI! CANCELED DUE TO LACK OF INTEREST!!! Will try again next month or the month after. Maui Beach Hotel. Kahului, Maui. Works out to around 10 to 12 dollars an hour and you will find it's more than worth it! Saturday, we should end well before 4pm but I booked the room late just in case and so that we don't have to rush out. Take an hour for lunch plus breaks and we will have about 11 hours to get our ten hour training done. Those 10 hours are PACKED believe me. It's faced paced hands on fun. This will be a standard "10 hour training" where we cover basic operations (addition subtraction, multiplication and division) as applied to whole numbers, integers, fractions, and algebra. In addition there will be a short session on percents and algebraic problem solving. Throw in a few story problems and TEN HOURS whizzes by. People are always amazed at the time. We used to have a program where we did 10 hours, then 20 hours, then 30 hours, then 40 hours at at the end of each session people were amazed at how fast time seemed to go. Pre-requisite for the 10 hour training was/is the ability to count to 9, identify shapes particularly squares and rectangles and be able to tell whether objects are same or different. In Utah where the children where especially well behaved we had some very young children come to the trainings...one of them got on the news there doing 4th power algebra. I was the one who taught his parents to teach him...I wish I had that footage: it's great. Once you took the ten hour you could go to the 20 hour and so on...one parent commented that even though the trainings got longer and longer it seemed like they got shorter and shorter...because learning is fun and times flies when you are having fun. If you are a novice, have a set of blocks, never had a set of blocks, are homeschooling, are a teacher and are wondering how to use the manipulatives left on a shelf in your room, have read about using manipulatives and would like to know more, or would just like to become more effective at teaching math in a conceptual way this seminar is for you. In short anybody who teaches math to anybody whether it's parents or teachers...as if there is a difference between the two. Tutors are especially welcome. So are well behaved children over the age of 11. The way we teach math putting a grade level on the information is difficult, but this is an introductory course and will cover math through the high school level, although you will quickly see how and why little kids can do algebra, fractions complex story problems and more. This is a radical departure from the way you (and I initially) were taught math. You will "see and do" not just watch. Math becomes child's play, even "advanced math." If you have blocks bring them!!! And paper and pencil too!!! You can bring your own lunch and snacks, or go out for lunch or for 4.99 plus tax a box lunch will be provided by the Hotel. Bring healthy snacks. There will be ice water provided. I need help putting this on and promoting it. I am willing to pay commissions to those who bring paid sign ups in the form of CASH or a reduction in your attendance fee...$20.00 for each paid sign up, $35.00 for each couple. I need a videographer to document the whole thing and hopefully I can make a sale-able product out of it. Those in attendance will get a copy FREE. I also plan on doing a much bigger seminar later in the year which will cost more than 10 times as much but will only be 2.5 times as long which will be marketed world wide via the internet...most will come from the USA, but you never know who will show up to these things. Those who attend this event will be able to come to that event for a substantial discount. Those attending will also get FREE passwords and other "Bonus" materials as they become available over the coming year. 6p Greeting. "Getting to know you." Find out about who is there and who I am. 30 min. Detailed introduction to the 5 basic concepts, hero zero and NFGBT1 90 min. Q&A / wrap up. Till 4. Fractions are the bane of many a student. In fact some companies spend a lot of money every year training their employees on the topic...rules and process are easily forgotten. As it turns out, fractions are just math and all math is is counting. So let's learn how to count fractions the easy way: when you can see it. We can just count pieces and see what we get. A lesson on Improper Fractions. We can add them together. We can make problem solving with fractions simple...and a whole lot more. Go here to see some story problems with a 6th grader and keep in mind I have several students MUCH younger than 12 that can do the kinds of story problems he is doing here. and I will make a video and post eventually...working on a fractions page at the house of math; ran into a couple of snags but it's coming. This post will have more soon. The screencast is just the fractions portion of the lesson I did on division. All we do is count. Knowing what one is is VERY important. We also learn multiplication concepts...but mostly we are just learning how to COUNT. Here is a screencast of a session I did with a couple of students where I finally remembered to bring out my Camera...and snap a few pictures. Even then I should have taken more...We used the same board as we did last week which had what looks like a big scary algebra problem on it...but they know it's easy: all you do is count. BTW the little girl came to math rather than stay home even though she was sick and throwing up...because it's more fun than staying home and being sick. By the end of class she was feeling much better. Basically we played with division concepts and notation. People in education are starting to get it. 20 years ago I wanted to make math music videos to teach math...blocks dancing around; math concepts visually obvious and set to music...one day this will happen. Here at the university level is a video explaining simple economics...which I have argued would be easily understood by a populace with critical thinking skills that had a excellent handle on math. Instead the average American has a difficult time with FRACTIONS...much less ALGEBRA, and even less than that simple economics and money. Happily for the bankers and politicians the teaching system hasn't even been able to make division concepts clear. The average person can't explain why we invert and multiply if they can even remember to do it when trying a fraction problem involving division. Just for fun: Three times what is two and five eighths? Easy or hard? Three times what is two and five eighths? I rest my case. Soon I'll have a webpage on fractions with video and some blog posts too...and that problem will be duck soup. The point of this post is we need to move to presenting the mathematics like this, edutainment I believe it's called...I'm getting there. BTW the answer to the question is 21/24...I could see it could you and if you did get it did you remember a rule or a concept like no fun get back to one? Of course we are easily fooled by men in suits who tell us the answer to debt is more debt and the answer to too much money in the system us more money in the system...the populace can't do MATH. Here is a very poor quality screencast containing some vintage footage of a math center I helped open in Idaho along with some commercials for it...I taped it off the TV later I will do a better job and also do some editing as it is dubbed directly from vhs to dvd...it's 8:33 long. I put a few minutes of some footage of Jerry Mortensen himself explaining some of the manipulatives he created and I am assured I will be able to sell more manipulatives in the coming year...the multi tens kit, fractions kit and basic operations kit...btw I have two basic operations kits that have the smaller manipulatives thru 1000 or x3 (but no big blue square) if you would like to get one of them let me know just contact me at Gmail. BTW I spent more time in Utah than Idaho, and helped open centers in SLC, Omaha Nebraska, South Carolina and more. I can't find or don't have video from all those places...this is just some video I happened to find. I saw this on a math Q and A site. Hero zero and no fun get back to one. You have to know how to factor polynomials. 2x2 - x - 3 isn't it? The x's are just raised by a factor of 2...and with our imaginations we can name the pieces anything we want...and you can see if a 12 year old can play with problems like 2x2 - x - 3 and look at them as puzzles not things to be feared and in fact as confidence grows this stuff is fun and challenging...and easily solved given time. BTW this is post 100!!! After a while it gets old, well for the blog and people watching Youtube videos...all we do is form rectangles and count the sides learn about multiplication, addition and division as well as factoring concepts...as time goes by they get better and better. Here is a short screen cast covering a tutoring session with an Autistic student. We did multiplication, subtraction and algebra...and it was all easy and fun. Ran across a post from a fellow blogger from India. For the purists out there: as you go from left to right in the drawing it is correct but above the a2 it should be "ab" and "ac", and the other black square should be a "bc" because the pattern is over then up... → ↑ for multiplication. Just to be sure I gave it to a 12 year old to do and he had no problems with it...just took a while to count and label all the parts. New and Improved: Now with more room for your math enjoyment. Meantime enjoy the roomier, mathier new version. 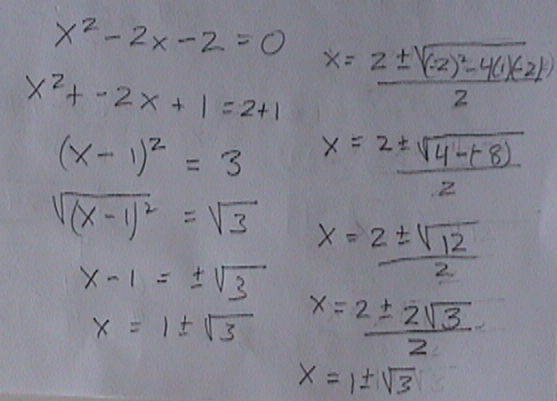 Here is a screen cast showing 4 examples of quadratics. All symbols no pictures. If you have spent some time at my website and reading this blog you can SEE what the symbols represent and if you needed to you could draw pictures of ALL of these problems thus making it easy for you to get it even if you were only 12 years old. 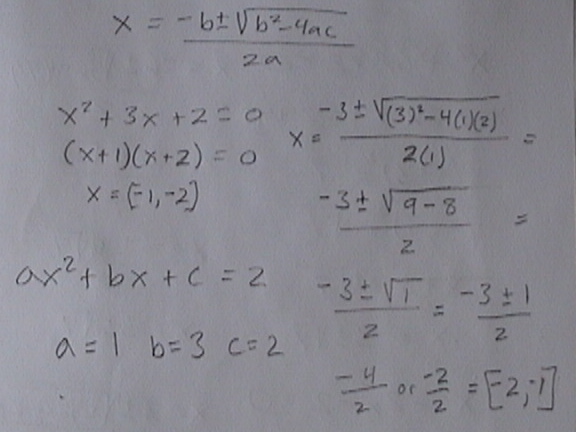 Check out my other (more in depth) page on the quadratic formula HERE. For those that have youtube blocked at school (I only get 2GB a month bandwidth on this so if it doesn't work check back in a month when the bandwidth resets). ax2 + bx + c = 0 NOT 2...careless error in notation on my part. Start easy and work your way up. The first too are easy to factor and therefore are easy to check when we are first starting out with the quadratic formula. The next one is a little more of a challenge and assumes you know a little about square roots...but you know what happens when you assume. Anyhow, you can learn a lot of math at the house of math for FREE and some of the algebra on the password protected pages costs just a few bucks. Need help with the basics like distributive theory click here. I Introduced a 4 and a 5 year old to Pythagorean Theorem. Really it's that easy. x2 + 8x + ?? ?? 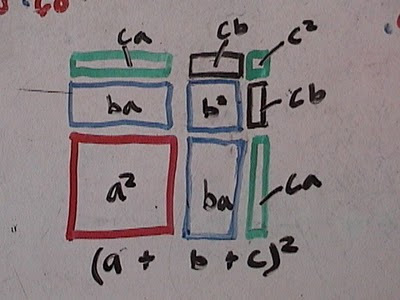 = What completes the square? x2 + 8x + 16 and we talked about (x+4)2. To make it a bit of a challenge I changed it to x2 + 8x + 12. But he's almost at the point where they are all EASY. Note how his brother builds squares and the quietly arranges them according to size while I am focused on his brother...he received a lot of praise off camera when we reviewed this video together. Then we played with the concept of squaring the sides of a triangle. a2 + b2 = C2!!! it will make total sense to them. This was just the first time they saw this and they will see it many times again before they reach the ripe old age of 7...note how in the video I didn't even write out the equation. We just played with the blocks and got an experience of the concepts. Next time when we do write the symbols that go along with the blocks they will understand what it means instead of just memorizing a formula. They will also see that a + b > c ALWAYS, although they may make the joke 3 + 4 = 5 they will know it's a joke and that 32 + 42 = 52 is true but 3 + 4 = 5 isn't. Also note how much faster and easier this lesson is now that they each can skip count by 3's 4's and 5's...and this lesson gave then another chance to practice skip counting. Stay tuned for an additional video that is a more formal lesson for YOU on Pythagorean Theorem sans little children where we can see how to make "Pythagorean Triples" and understand more about the theorem before we ever have to get out our square rooting skills for numbers that aren't perfect squares. I talked to a few teachers who never saw a proof of this...they just got the formula and memorized it. I talk to teachers all the time that are amazed by this little demonstration...INCLUDE it in your lessons with little kids. Learn algebra for a buck. These should stand alone if you are starting here but it might be good to view and read some other pages first if this is your very first exposure to manipulative based learning for math. See also. Learn algebra for a buck. In fact you should go there if the above videos didn't make perfect sense to you...lots of free learning and more "advanced" stuff for a buck. A bright 4 year old has a fun time playing math. Before we knew it an hour had gone by. I remembered to take the camera out after about 20 minutes...we had already done some counting, added random numbers together and then started adding pairs, starting easy 1+1 and working our way up to 9+9. All 45 addends will be mastered using base ten blocks. I enlarged the photos in this post a little for those who use Pinterest. Then we did some multiplication and division. He likes division because he only has to count one side. We count by eights, then we count the sides, then we count the rectangle and each side. He can see 24 ÷ 8 = 3. The three eights are visually obvious too. Then we have fun counting and building 20 sixes. And even more fun knocking them down. On to some algebra puzzles. I tell him the pieces and he has to turn them into a rectangle. Base ten blocks are great for teaching algebra and addends and a whole lot more. The men help him count the sides. This one problem teaches him about counting, addends, factoring, multiplication and algebra all in one lesson. This took about 15 minutes from start to finish...15 is a lot to handle when you are four. Note if he had to get out 15 individual units this problem would be nearly impossible and would take a lot longer. He took a while figuring out which blocks to make his 15 with, he has some experience factoring so he knows a 10 and a 5 aren't going to cut it. At last he has decided on 5's. He uses them to shape the rest of his rectangle. I tell my high school students what this child already knows: the way to factor it lies in the factors of the constant. Now that he has three fives all he has to do is make those pesky x's form a rectangle. A little more work and he has it. Now his pals can help him count the sides. Just for the fun of it he wrote the factors himself to the best of his ability. "It almost looks like a 5"
He was quite proud of his 3. Using base ten blocks to teach concepts and understanding of math is a very powerful thing. Just because they can't write doesn't mean they can't learn math; writing isn't a perquisite for math anymore than writing is a prerequisite for learning English. You will find that students who learn math this way will be able to do a lot more math in their heads than students taught using the current completely ineffectual way we use now. 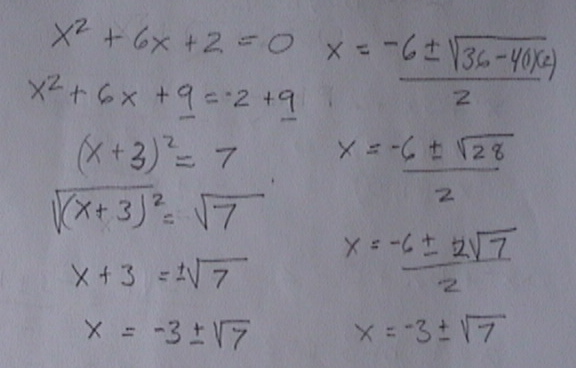 x2 + 8x + 15 = (x + 5)(x + 3) is easy and fun to do and completely understood. One means the rectangle the other means the sides. Later we will deepen understanding and add more concepts on top of these basics. Can you see math will always be easy for this child? No fear of new stuff in the future because he has math experience now. Using base ten blocks makes understanding math easy and fun...child's play. If you enjoyed this post you will also enjoy this popular post and screencast showing much less structured play with clay for learning math concepts. Math enrichment and a math rich environment go hand in hand. Learn more Algebra for a just a few bucks. Trig for 8 year olds. Just what it says, click the link and find out more. This post remains popular going on two years later...he was just 4 and 1/4 when we made this...now algebra is no big deal and fractions and multiplication are fun...he is the go to guy in his kindergarten class when kids want to know what to do when they have math. And now he is the go to guy in 1st grade. Please take a moment and watch the vid on the concepts page under the heading "Early Exposure to Math Concepts Helps Ensure Success." It's only 3 and a half minutes long and should help dispel the myth that you don't want to start math too early. There is no "too early." 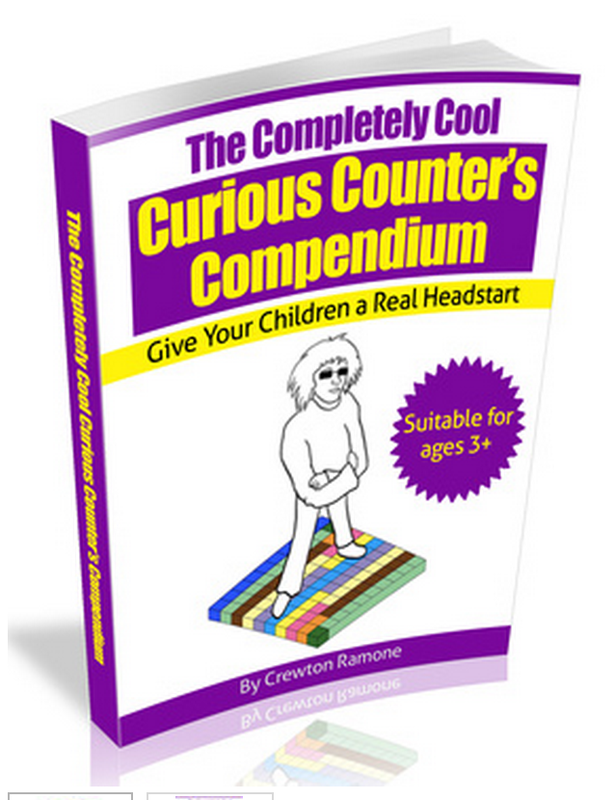 Give your young child the advantage in math with my cool counters compendium. Get this book if you have children 7 and under...find out more about it, and a look inside here. You can get it without a password for just $4.99 People's comments about the base ten block book here.